I recently got engaged and have been thinking of somethings old that I could borrow from my ancestors for my own wedding. 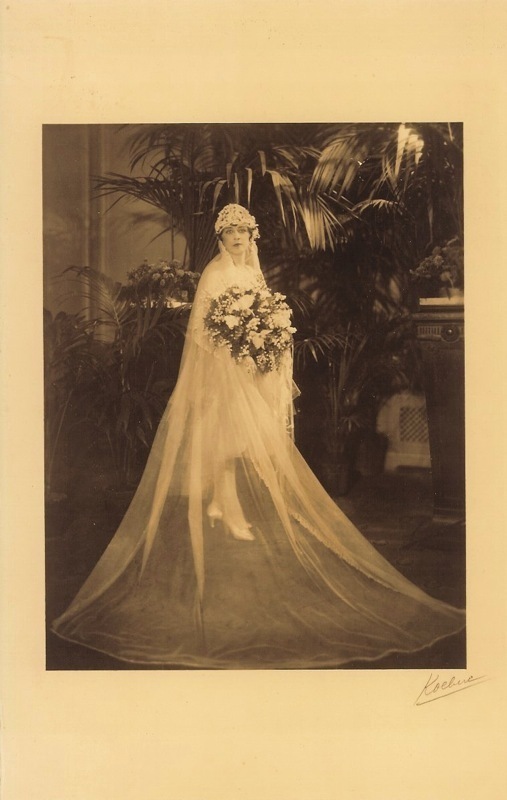 My great-grandmother Rona’s amazing veil and headpiece did not immediately spring to mind, though they would be quite spectacular, though much less dramatic on me, since I am at least 6 or 7 inches taller than Rona was. I do like that her dress was obviously quite short, as far as wedding dresses go, and I’m sure it was the utmost in fashionable, because she (and her mother) were always dressed to the nines. I’ve never taken the time to examine this photograph closely, and I’ve never seen any other photos from this wedding, at least, not that I remember. The Sentinel, a Chicago Jewish newspaper, tells me that the wedding was held at the Stevens Hotel. The ceremony was held “on Tuesday evening, November 29, followed by a reception for friends at 8:30 p.m. in the North ballroom of the hotel.” Rabbi Louis Mann officiated. The Stevens Hotel is exactly the type of place I would have imagined the wedding took place. It was brand new in November 1927, having just opened that year. It took up an entire city block on Michigan Avenue between 7th and 8th Streets and had 3000 rooms, making it the largest hotel in the world. Built by the family of Supreme Court Justice John Paul Stevens, the Stevenses later lost the hotel, which is now known as the Chicago Hilton and Towers, through a series of headline grabbing events. Judging by the dress, and the veil, and the gigantic bouquet, this was a very elaborate wedding, which is unsurprising, considering Rona’s mother’s propensity towards the elaborate. There was not the same wedding-industrial complex in 1927 that there is now, and I want to hear stories about how this wedding was planned, and how long it took, and how big it was. If I can’t wear Rona’s veil or that magnificent headpiece, at least I can have something of her wedding to borrow, even if it is only in my head. (marriage announcement printed in The Sentinel, November 25, 1927, p. 22; available digitally, Asher Library, Spertus Institute of Jewish Studies, accessed April 25, 2010; Stevens Hotel article from Chicago Magazine, October 2006; available online, accessed April 25, 2010).